I have received a few comments about my use of cats in the photo captions for some of my articles. I wish that I could honestly (without going to confession) state that I apologize for offending you. ("You" might be a dog lover, allergic, or dare I say a cat-unliker). But I can't. I love cats. My dad loved cats, and as I was growing up, we always had a tabby kitty in our house. When one died, my Dad would bring another one home the next day. They have always been a part of my life. So, love me, love my cat (or just close your eyes when a cat-caption pops up). So, I'll try to contain myself to just one cat-caption per article. Deal? Here's our first (cat free) question. This first question is from Mary. "What are your thoughts on granola? Is this easy to make? 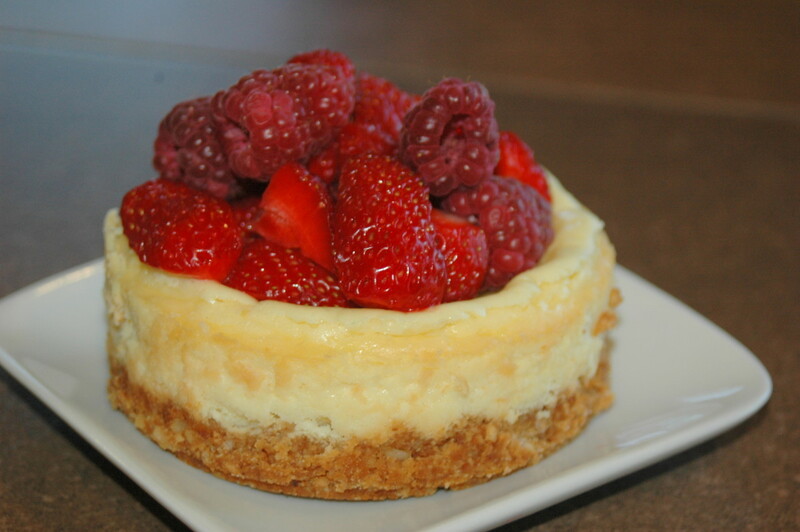 I think my husband could enjoy this as an impromptu dessert." Mary, I don't know if granola is known worldwide, so first, let me explain what it is, how it's used, and then we'll get down to the nitty-gritty. Back in 1863, Dr. James Caleb Jackson created the world’s first recipe for what would become granola. The dish (he called it granula) consisted of dense, unsweetened bran nuggets, soaked in milk. The Kellogs company began to market "granola" about 100 years ago. Their version is made of rolled oats flavored with sweeteners (honey, malt, or sugar), sprinkled with spices, enriched with vegetable oil, and baked or toasted. Dried fruits and/or chopped nuts are often added. Granola can be a healthy start to your day, a great mid-day snack, or a fun dessert (as you suggested). Or it can be a sugar-loaded fat-bomb in the guise of health-food. 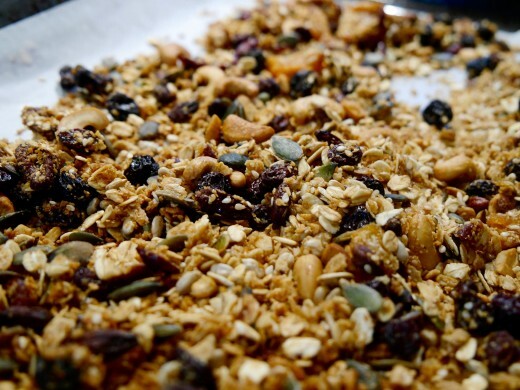 "Serving sizes on granola labels can vary widely, from a quarter cup to one-half cup. But the average person eating granola for breakfast is probably consuming closer to a full cup, said Andy Bellatti, a Las Vegas-based dietitian. "A cup of Nature Valley Oats ’n Honey Protein Granola has 24 grams of sugar and actually contains more sugar than protein by weight. Nature Valley also has a Peanut Butter ’n Dark Chocolate Protein Granola that has 30 grams of sugar per cup. Bear Naked Honey Almond Granola has 20 grams of sugar per cup. By comparison, a slice of chocolate cake with frosting has 26 grams of sugar. A cup of ice cream has 28 grams of sugar. A regular Krispy Kreme glazed doughnut has 10 grams of sugar." You asked for recipes. 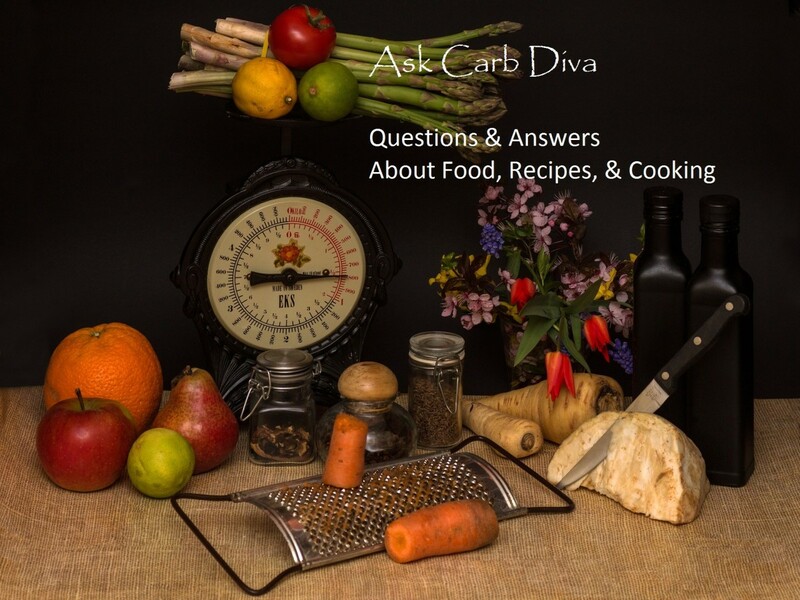 To start our search on the right foot, I went to the CookingLight website where you can always find recipes that are healthy, balanced, easy to make, and made of readily-available ingredients. Their take on granola is spicy, barely sweet and one serving is only 169 calories. Next, because you have a coconut farm, I thought something that showcases that treat might be helpful. The author of this buttery coconut granola prepares foods that are allergen-free. If you don't have problems with dairy you could probably use real butter in place of the vegan margarine that she recommends. One serving is 260 calories. 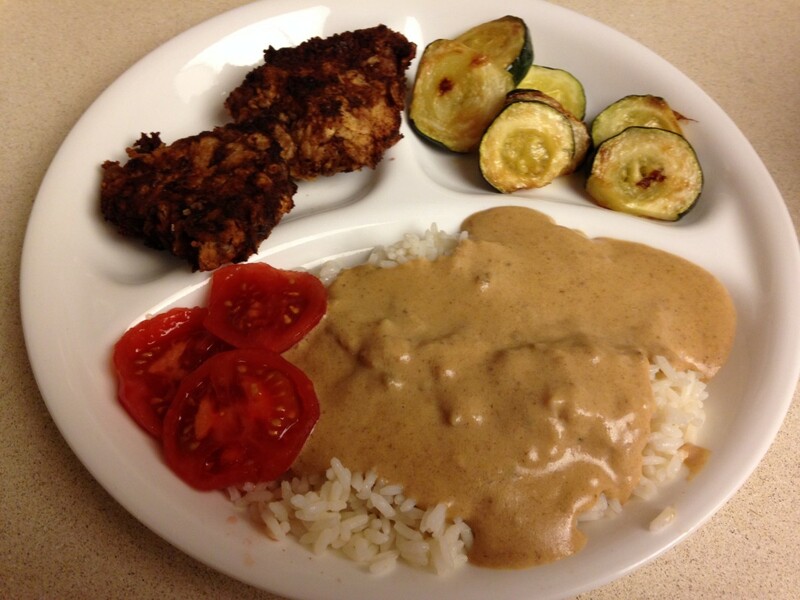 Finally, this recipe from WellPlated utilizes a crockpot (slow cooker) instead of the oven. The crockpot does all of the heavy lifting, and you can have homemade granola in 3 hours without the bother of stirring and fussing. Also nice to be able to "bake" something without eating up the house with the oven. This makes a large batch, and a serving is 280 calories. Will I Die From Eating Raw Cookie Dough? When I make cookies, I normally divide the dough and put some in the freezer for future use. Well, when 3 pm rolls around I get peckish and tend to eat some of this dough. Is it only the threat of salmonella from the eggs that I am in danger of getting or is there a problem with eating raw flour? Am I dicing with death for the sake of a sugar high? I was working full time and was "famous" for spending one weekend per month making soups, stews, casseroles, stuffed baked potatoes, meatloaf, etc. to store and then defrost the night before so that preparing the evening meal was easy-to-do (usually 30 minutes). Needless to say, making cookie dough, portioning it into scoop-size, and then freezing was a part of the equation. I don't think my family ever did the math on how much cookie dough went into the freezer and how much actually was baked (at least I hope not). Raw eggs: I don't want to ruin anyone's appetite, but the biggest concern with raw eggs is where they come from. Yes, they come from hens, but did you know that hens have only one "exit door"? Yup, eggs pop out through the same hole as chicken poop. 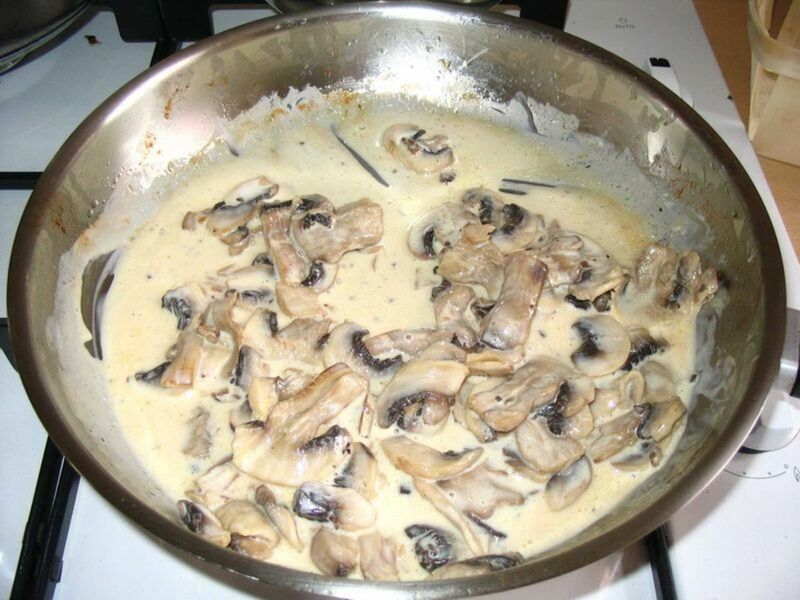 So, salmonella contamination can be present on the shell or even absorbed into the shell. I could probably add that raw eggs are not as nutritious as cooked eggs (The Journal of Nutrition revealed that our bodies only absorb 50 percent of an egg’s protein when we consume it raw, versus 90 percent when we consume it cooked), but let's get real here. 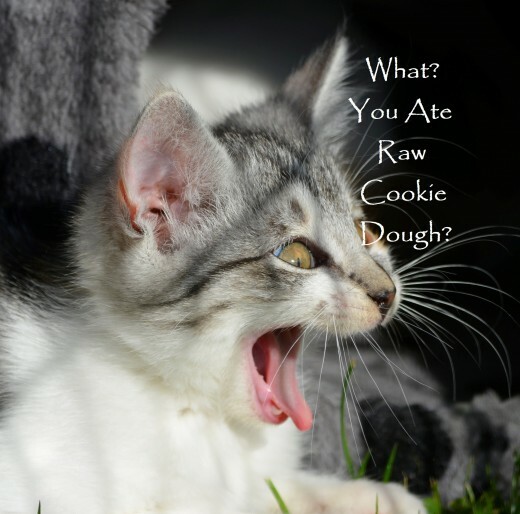 No one eats raw cookie dough for the health benefits. Raw flour: This is a surprise for a lot of people, but when you consider that wheat grows in a field (not in an enclosed, contained environment), critters that walk or fly do their thing everywhere, including in wheat fields. When the wheat is harvested it (of course) isn't washed. I haven't been able to find any statistics on the odds of coming on contact with infected flour, but why take unnecessary chances? 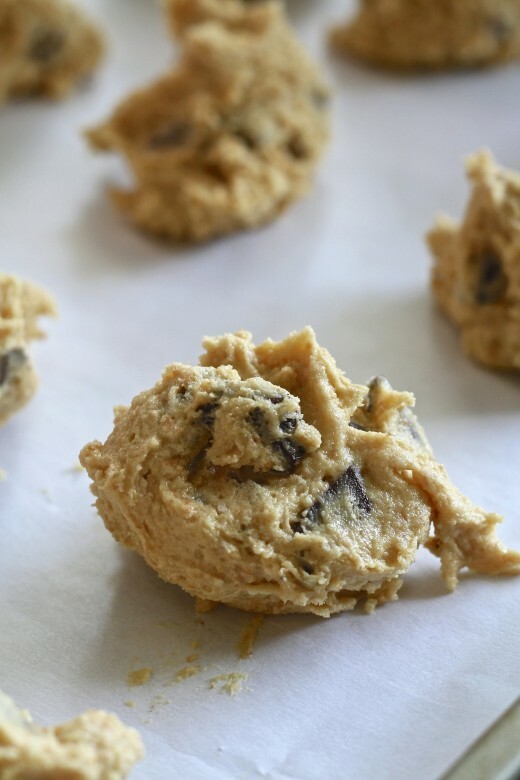 But there is some good news; commercial cookie dough, like that found in cookie dough ice cream and packaged, refrigerated cookie dough, is safe to nibble on, as it has been pasteurized and heat-treated. Each week I showcase one of my "Favorite Things" (in the spirit of Julie Andrews in "The Sound of Music"). I promise that this 'thing' from my equipment drawer will not be an expensive one-use-only promotional product. Most (if not all) are available on Amazon and some might even be in your local Dollar Store. Today, I will be rhapsodizing about my kitchen timer. This sweet little gem is small. Small enough to fit in my pocket (which is helpful because I have been known to set it and quite literally forget it. Wander away to places from which the timer beeping cannot be heard). This timer is extremely easy to figure out. I am not a techie-sort of person, so this is vital. And finally, unlike me (and perhaps a few of you) it can do three things at once. It can time 3 different dishes (and each of the 3 alarms has a different sound). 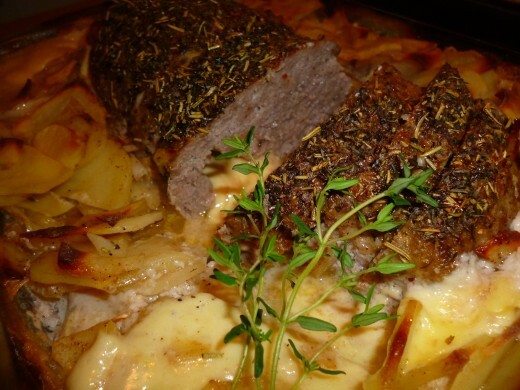 How do you keep meatloaf moist? It's one of my favorite meals, but I'm always afraid to attempt it for fear of having a dry result. Bill, there's a secret to making the perfect meatloaf, a meatloaf that is tender, not dense, flavorful, not boring, firm, not crumbly. That secret is what every Italian nana uses to make perfect meatballs and sauce—a panade. A panade is simply stale bread soaked in milk. When blended with the meat(s) you achieve a loaf that holds together but isn't solid like a brick. It's light and bursting with flavor, like this one by FoodSoGoodMall. That's it for today. Ask me anything food-related; I promise there's no judgment here. You can be anonymous if you wish. Your secrets are safe with me. 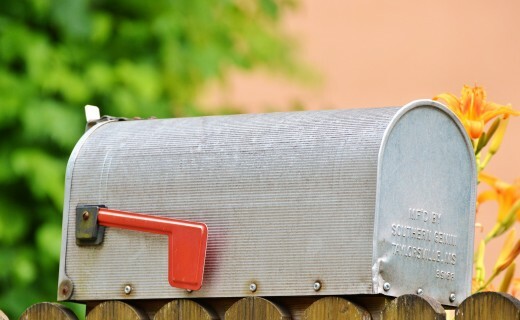 You can post your questions in the comments section below, or feel free to write to me at lindalum52@gmail.com. See you next week, same time, same place. Hi in New York? Now how is rhapsodizing. Blessings on you and your work. Thanks. Im so high in NY, don't know whether I'm coming or going. Lol. Gove the cat my Love. Manatita, yes my dad was a lover of cats. We never had a dog. Thanks for stopping by and it is only Tuesday. You grew up with cats? I don't recall seeing too many here. Rhapsodizing eh? Cool! Not saying much today. Have a great Tuesday or is it Wednesday? Don't really know. Lori - Steilacoom. Oh my goodness, we're almost neighbors! I'm glad to know that the "meatloaf muffins" idea might be of benefit to you. Gig Harbor. How about you. Great idea about muffin cups. Lori, thank you so much. Your words, like you, are always so kind and uplifting. Granola is really easy-peasy. When my girls were little they would make granola as a Christmas gift for their teachers. You know you can bake meatloaf in muffin cups--one "muffin" is a serving, and you can freeze the rest. Or you can pre-form them in the cups, freeze until firm, and then store in freezer-safe packaging and just thaw and bake as needed. May I ask where in the Pacific NW you live? As you can see, I'm in Washington State. I love this. I am mad about granola and never thought about making my own, I'm going to try it. And dang, that meat loaf looks so good and it's the same recipe I make, though because I live alone I rarely make it but I can freeze it. Wonderful column. Glad to hear that Shauna. Mary, I used to make my own cookie dough too. That's not to imply that I now purchase pre-made. I just don't make cookies. A minute on the lips a year on the hips. Linda, I love your kitty pix. I'm a cat person, too, so they always get a smile out of me. Well the buttery granola has got my vote. I think that is the one I shall make. It is funny on that link she said that oats don't have gluten. I thought that but when I read my box, it said they did. The author explained that because of the possibility of cross contamination that is why it says it. So I had a question answered that I didn't even ask yet! Here, food labeling is a big deal. GM foods are labeled with a yellow triangle and a black T inside. I make my own cookie dough so the flour could contain some nasties. It is a bad habit, I should do something about. I knew about the bread and milk for meatloaf but didn't know there was a name for it. 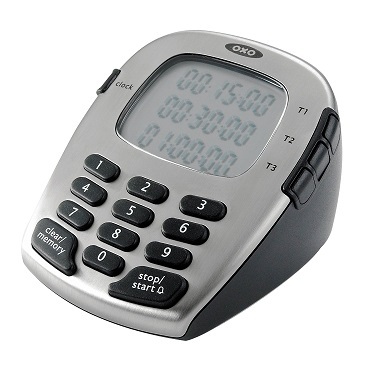 I love that timer, I didn't know OXO made one. I'm a fan of their products. Helpful article as always, thanks. Bill, don't ask me to explain the science of it, but it does work. Without the bread meatloaf can be very dense. Let me know when dinner's ready. Well I'll be darned! I have never heard of the stale bread trick. Thank you my friend. I appreciate the tip. Flourish, your secret is safe with me. My kitty kits on the kitchen queen which is just a hop away from the central island cooktop in my kitchen. From there he watches my every move (hoping, I'm sure, that something CAT-astrophic will happen, such as me dropping the chicken onto the floor). I love your cat photos. My cats help me cook, usually by sitting at my feet while I chop or stir. Sometimes, however, my orange tabby, Simon gets up on the counter and watches me. Don’t tell anyone though.